This set of Machine Kinematics Mcqs focuses on “Application of Kutzbach Criterion to Plane Mechanisms”. Explanation: Cam consists of 3 links. 2. Which of the following mechanisms produces mathematically an exact straight line motion? Explanation: Peaucellier’s mechanism gives straight line motion. Explanation: There will be no change. Explanation: In a Kinematic chain, the number of links should be equal to the number of turning pairs. Explanation: Kinematic pair is ajoint of two elements that permits relative motion. Hence, it is Kinematically sound. 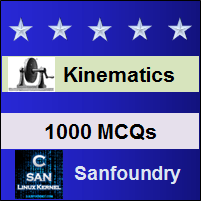 To practice MCQs on all areas of Machine Kinematics, here is complete set of 1000+ Multiple Choice Questions and Answers.